Does anybody have pictures of MLP-1 side 1 (front side) from around 1974 till they modified it for the space shuttle? I'm trying to find proof that the side of the platform had signs signifying the launches that took place on MLP-1. A photo I took in April of 1981 has a sign that reads: Apollo 4, Apollo 8, Apollo 11, Skylab 2, Skylab 3, Skylab 4, ASTP. Are you sure it was taken in April 1981? At that time refurbished MLP-1 was supporting STS-1 launch operations, until April 12, at Pad 39A. By the early 1980s two of the three mobile launcher platforms (1 and 2) were shuttle operational. Gone from both were all the old Apollo-era structures and equipment that were modified for the shuttle program. The photo was taken on April 6, 1981. There is no doubt about that. But I had never noticed before that there were two MLPs with the number 1 at that time! A second photo taken on the same day shows the original MLP-1 with the Skylab/ASTP milkstool. In the background is MLP-2. But at that same time STS-1 was on the pad, also on MLP-1! Bingo! I found proof in a photo of the Enterprise rollout in May 1979, using MLP-1. If you look closely at the number, you can see it was changed from #3. So as I suspected the Apollo era MLP-3 became the Shuttle-era MLP-1! While covering the early shuttle program quite extensively, I just don't know when and why this was done. Even in my STS-1 "rollout" article coverage as a news media rep, nearing 30 years ago, along with many other shuttle related stories that were published throughout the late 1970s and early 80s, my articles only mentioned in some minor detail that MLP-1 and 2 were modified for the shuttle era. Old shuttle news releases from NASA also confirm my original findings, however, as time permits I would like to examine various photo/history files of that MLP refurbishment period. If I come to a dead end from my own space resource library, perhaps a call or visit to NASA's history office here at Kennedy, along with the press site offices, may be required if more research is needed. While certainly not a big deal or anything, I do enjoy working on a challenge or mystery like this. Meanwhile, if you (or anyone else) can shed any new light to the topic, let me know and I'll do the same from this end. In the post-Apollo years, the umbilical towers from Mobile Launchers 2 and 3 were removed. Portions of these tower structures were erected at the two Space Shuttle (or STS, for Space Transport System) launch pads, Pads 39 A and B. These permanent structures are now known as the "Fixed Service Structure" or in NASA's language of acronyms, FSS. The umbilical tower from Mobile Launcher 1 (which was the platform used for the most significant Apollo Missions) was taken apart and stored in the Kennedy Space Center's industrial area. Nice work, as I just can't recall the umbilical tower takedowns from the late 70s in this capacity. There was a detailed NASA release, that I am still trying to locate here, that did better explain the refurbishment developments of the launch platforms. Why NASA didn't leave MLP-3 as the same designation, instead of changing it to #1, doesn't really make a lot of sense to me. Perhaps with the start of the shuttle program, they wanted to use a #1 platform for engineering and "new start" operations. Why not just leave the #3 unit as the first modified platform to launch a shuttle vehicle? I found confirmation that today's MLP-3 was called Mobile Launcher 1 during the Apollo era. An article in Lockheed's "Stargazer" newsletter dated June 15, 1989 describes how MLP-3 was being activated for shuttle launches. It was the last of the three MLPs to be converted. Frank Loesel of LSOC pointed out that MLP-3 was used to support some of the most historic missions of the Apollo era. MLP-3 was designated Mobile Launcher 1 then. It was used for the very first Saturn 5 launch in November of 1967. The article goes on describing how Apollo 8 and Apollo 11 were launched from that Mobile Launcher, after which is was modified for Skylab and ASTP. In September 1984 modifications for the shuttle began by dismantling the Launch Umbilical Tower. This information is also confirmed in an article in KSC's 'Spaceport News' dated Sept. 8, 1989. So Mobile Launcher 1 is now MLP-3. I have heard that the crawler/transporters are named "Hans" and "Franz" — anyone know if this is true, and/or have photos of the names on the vehicles? The names Hans and Franz are honorary and apparently interchangeable. When I toured one of the crawlers in 2006, the shuttle era drivers said that their "names" do not appear on the vehicles themselves. The names Hans and Franz came about in the mid-1990s and I think the first documented use for them was the Discovery Channel's documentary "The Space Shuttle" from 1994 where a crawler driver mentioned he nicknamed the pair that because they "pump you up." Are there any pictures looking down on the milkstool that show the detail of the launch mounts, holddown arms, and tail umbilical connectors? Are these launch mounts and other hardware from Pad 34? The Skylab Saturn IB Flight Manual on p. 7-3 (p. 228 in the PDF) notes that "Firing accessories for the S-IB stage were removed from LC-34/37B and are installed on the pedestal deck." It contains a description of the launcher and on p. 232 of the PDF there's a diagram of the propellant masts, short cable masts, holddown arms, boattail conditioning connectors, etc. During the MLP-1 handover ceremony (from the shuttle program to Constellation), Mike Leinbach referred to missions that the Apollo-era ML-1 supported. Assuming the ML-1/MLP-3, ML-3/MLP-1 switcheroo is correct (and I find no reason to doubt it), then perhaps Mr. Leinbach should have been recalling Apollos 10, 13, 15, 16, and 17. Like Ken said, it's really not a big deal nitpicking over which is which. Seeing the "Go Ares I-X!" banner revealed was exciting, and whatever the specific history of this item is, it is ultimately one of the larger tangible reminders of the hard work and dedication of those who have supported (literally) manned spaceflight over the last 40+ years. To the best of my knowledge, the original MLP 1 was used for the most significant missions (Apollo 8, 11, Skylab 2-4, and ASTP). It was also the last to be taken apart. The fate of its Launch Umbilical Tower was a junkyard in the industrial area of KSC. There were efforts to restore/save this Launch Umbilical Tower, but it has now been scrapped due to environmental regulations. This effort was in large part due to the historic missions that had used this tower. Meanwhile in 78-79 (?) 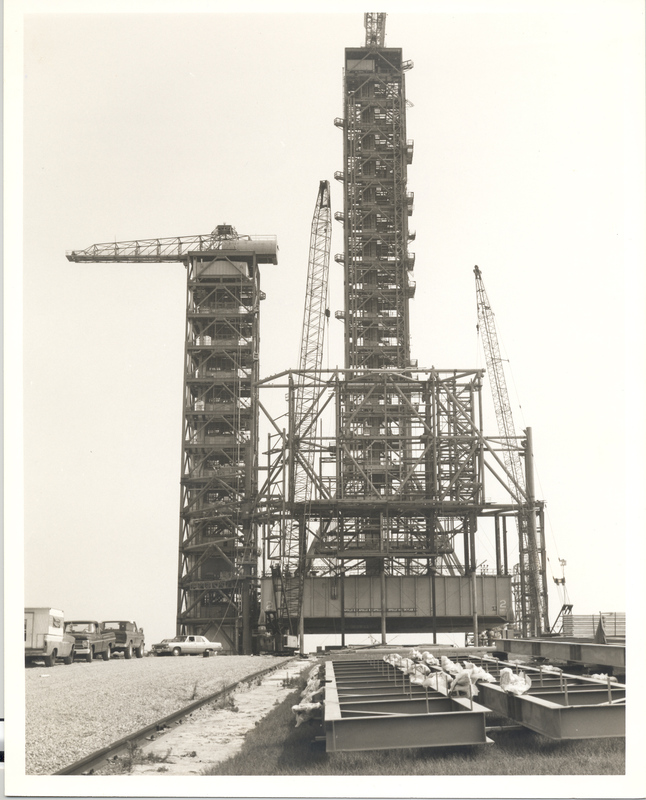 the Launch Umbilical Tower on MLP 2 and 3 were installed and modified as the Fixed Service Structures for the shuttle pads 39A and 39B. The associated launch platforms themselves were renumbered MLP 1 and MLP 2 and modified to handle the shuttle. In 1981, after being disassembled and having its tower placed in storage, MLP 1 was renumbered to MLP 3 and converted for shuttle operations. So to recap, MLP 1 was indeed renamed MLP 3, but its Launch Umbilical Tower was not used as a part of shuttle operations. I would greatly appreciate information on MLPs 1, 2 and 3. Which MLP did Apollo 6, Apollo 9 and Apollo 12 launch from and did MLP 1 become MLP 3 and MLP 3 become MLP 1 during the shuttle transition (like stated above)? Mike Leinbach said that MLP 1 (which recently launched STS-119) has had 51 launches from the platform. Does anyone know which space shuttle missions were launched from MLP 1 (and MLP 2 and MLP 3 as well)? 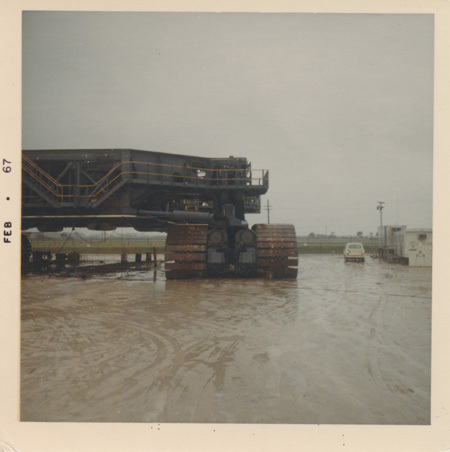 Which crawler-transporters hauled which Apollo flights out to the pad? 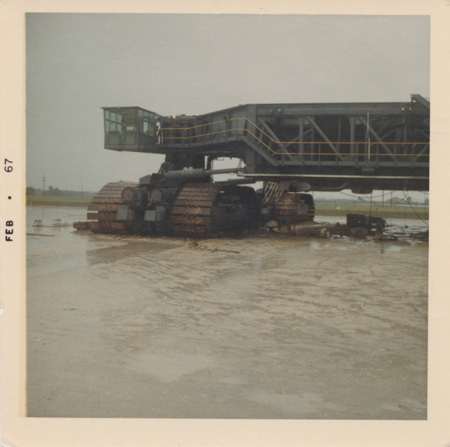 I thought I would share these recently acquired vintage Kodacolor prints of one of the crawler transporters and an associated photo of Launch Complex 34. All were taken in February 1967, just after the Apollo 1 spacecraft fire. Thanks to Ken Havekotte for his keen eye in identifying the pad. All brought to you courtesy of the Marion Steamshovel and Power Company of Ohio! More MLP history can be found in this 2009 HAER survey of the Mobile Launcher Platforms. I am assuming that since the tower on Apollo MLP #1 was not used for shuttle operations, and was the parts in the scrapyard, that its upper levels are now those in the Saturn V exhibit at KSC? Here is the 2009 Historic American Engineering Record survey of the two Crawler Transporters. This 1976 photo shows the sign on ML-2 for Apollo 6, 9, 12, 14 and Skylab 1. The Apollo LUT swingarm 9 (white room) on ML-2 was repositioned to a lower level and became swingarm 6A for access to the Skylab 1 OWS. KSC-77P-160 is a 1977 photo of ML-2 and the FSS at Pad 39A. the ML-3 LUT was dismantled from December 1975 to March 1976; some sections were used to begin building the Pad 39A FSS later in 1976.
the ML-2 LUT was dismantled in 1978; some sections were used to begin building the Pad 39B FSS in 1979.
the ML-1 LUT was dismantled from June to December 1983; the sections were moved to the KSC boneyard and later scrapped. ML-1 was on display in High Bay 1 for the 1976 bicentennial exposition at the VAB. ML-2 was parked outside the VAB. 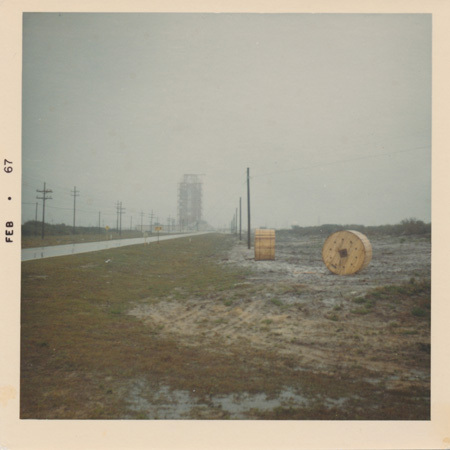 After the event, ML-2 was moved to Pad 39A, as seen in the 1976 and 1977 photos I linked earlier. Were there any other mods done to the White Room swingarm so it would match up to Skylab? Or was the workshop hatch designed to match the White Room arm? This 1983 edition of the Space News Roundup has a photo on page 1 of the STS-7 rollout on May 26. ML-1 can be seen in the background. They started to dismantle ML-1, the last mobile launcher, the following month. This October 1983 photo shows ML-1 outside the VAB. The ML-1 tower has been dismantled. ML-1 became MLP-3. Yep, that's the photo. Thanks for taking the time to look for it. It is interesting to see both Apollo and Shuttle in the same photo like that. I was surprised that the last LUT was still around as late as STS-7. Great shot. Thanks J.L. Facility modifications were part and parcel of the operations debate, much of the discussion focusing on a new "contingency" arm for access to the workshop. The December 1969 plan called for entry through the side door, a new feature that KSC had lobbied for. In the assembly building, technicians would reach that door from service platforms; at the pad a new swing arm would provide contingency access. In 1970, the arm became the principal means of access to the workshop. The launcher's uppermost service arm (9, which Apollo astronauts used to board the command module) was relocated adjacent to the workshop's side hatch. An airlock, designed to protect the interior of the workshop from contamination, replaced the Apollo white room at the end of the arm. Rather than build a second airlock for operations in the assembly building, the engineering office recommended that the new arm be used there also. Thanks! Same arm, new room/airlock then. This might help. The "white room" for Skylab appears to have been number 6A. 6A must be the renumbered sequence of the arms. And thanks for that picture... never seen it before!! Movement of the Mobile Service Structure, normally associated with a Saturn V operation, will not take place during the SL-1 launch. The MSS was used to inspect the second stage insulation of the Saturn V during the CDDT and then moved from Pad A to Pad B to support the SL-2 launch. 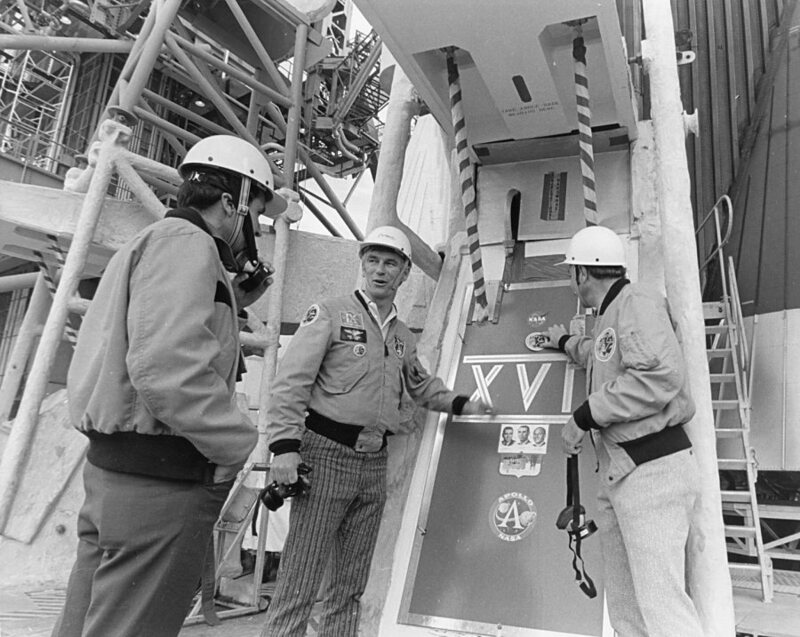 It is to be returned to Pad A only if a "scrub" is called after cryogenic loading of the Saturn V begins and another inspection of the second stage insulation panels is necessary. The MSS will be moved from Pad B to its park site - in a nominal launch sequence - after the T-20 hour mark in the SL-2 countdown. Photo 72-H-1508 shows decals and other Apollo 17 mission-related items attached to the tail service mast on the Mobile Launcher. The tail service mast for Skylab 1 also had a mission-related display. Was this done for any other Apollo missions? Photo KSC-76C-2388 shows a section of ML-3 being transported to pad 39A in 1976 to build the Fixed Service Structure. ML-2, with swing arms removed, is parked outside the VAB. ML-1 can be seen in High Bay 1 behind the VAB doors.